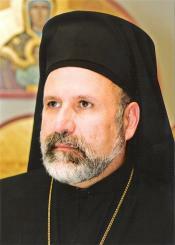 Metropolitan Philip (Saliba) of New York of the Antiochian Orthodox Church and his auxiliary bishops have elected Archimandrites John (Abdalah), Anthony (Michaels), and Nicholas (Ozone) to the episcopacy. Axios! Bishop-elect John is to be consecrated Bishop of Worcester with care of the New England region. Bishop-elect Anthony will be consecrated Bishop of Toledo with oversight of the Antiochian Orthodox Archdiocese's Midwestern region. Bishop-elect Nicholas will follow in the steps of St. Raphael of Brooklyn and be consecrated Bishop of Brooklyn, in which capacity he will serve as auxiliary to Metropolitan Philip in his oversight of the Antiochian Orthodox Archdiocese as a whole. Of the three new auxiliaries Bishop-elect John is Arab-American, Bishop-elect Anthony is half Arab-American, half Serbian-American and a native Michiganian Orthodox Christian, and Bishop-elect Nicholas is Syrian. More on the election together with the new auxiliary bishops' biographies can be found here. Pictured is one of the three new auxiliaries, Bishop-elect John (Abdalah) of Worcester.